You’ve probably seen the headlines “sitting is the new smoking” and are well aware of the hazards of a sedentary life. Unfortunately, many of us spend most of the day at a desk, commuting or sitting at work, a lifestyle that can take years off your life. There’s good news though! You don’t have to put in hours at the gym everyday in intense exercise classes to balance the effects of sitting. Studies show that people who are the most active throughout the day (standing, taking breaks from sitting, walking when possible…just getting up to move!) tend to be the leanest and healthiest. You can start with small goals and add on each week. The smallest changes can start to add up and lead to a big impact. Some studies suggest that getting up once every hour and walking for two minutes can help offset the negative effects of sitting all day. This is especially true if you’re sedentary more than half the day. However, two minutes per hour only adds up to 32 minutes each day, if you’re awake for 16 hours, so these two minutes per hour are no substitute for other activity, such as exercise and longer intervals of walking. Keeping that in mind, every moment you can move is a moment not to be wasted. So take those two minutes. You’ll get your blood flowing, your muscles moving, and your energy up. Every little bit adds up. No, this doesn’t mean taking tiny steps around the house and office. Rather, if you’re new to walking, set a realistic goal. Maybe this week, you try to walk 20 minutes every day. Then next week, increase that amount. And again the week after. See where we’re going? Twenty minutes today, could lead to 10,000 steps per day next month. There’s no better time to start than now. You knew it was coming. You’ve seen this advice for decades. When and if you’re able, take the stairs. This doesn’t just get you more steps on your fitness tracker. It will raise your heart rate more than casual walking. Your body likes varying levels of intensity in exercise and taking the stairs is a great way to turn that intensity up. If you’re feeling extra motivated, pick up the pace and make it a sprint. Taking the stairs also applies when traveling down floors. You’ll work your quads and get even more moving in. Have a conference call? Great! Grab your bluetooth and get walking around the office. In-person meeting? Also, great! Suggest to your colleague that you both step outside and walk around the block as you cover the topics of discussion. Walking around the block will give you even more of a refresher, as you’ll be getting some fresh air and natural light, a nice break from fluorescent lighting, if you ask me. I often try to take phone calls while I walk around the block. Have a lofty steps goal to reach? 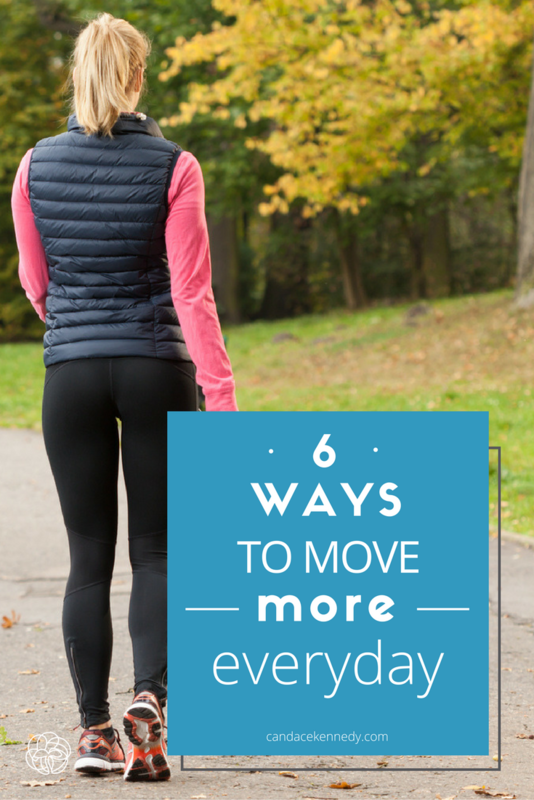 Try breaking it up into smaller walks throughout the day. If your goal is 6,000 steps, for example, try walking 2,000 in the morning, 2,000 on your lunch break, and another 2,000 in the evening with a friend or your family. You can also vary the intensity on your walks and make one a power walk, for an extra calorie burn. I’ve worn a pedometer for several years now and it’s still a powerful reminder to get up and move. When I first got a pedometer, it was a huge wakeup call for how sedentary I had become in my office job. And I even walk to work! It takes intention and effort to move every day, but it’s a habit worth forming. Some pedometers even have features where you can add your family and friends in the app for some “friendly competition.” It’s great motivation for those lazier days. What’s your favorite way to get more steps in? Share your tips in the comments. This is a repost from an article I wrote for the SOLS blog.